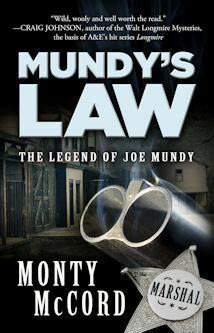 "Wild, wooly and well worth the read--Monty McCord's Mundy's Law is judged to be one stand-up western that delivers forthwith." --Craig Johnson, New York Times bestselling author of the Walt Longmire Mysteries, the basis of A&E's hit series Longmire. “Sprinkling the novel with factual settlements, intricate detail and realistic characters gives it a historically authentic feel.” --Alan J. Bartels, Nebraska Life Magazine. Nebraska, 1876. The western frontier is wild and needs a lawman who can tame it. Joe Mundy is such a man. A veteran of the Civil War and Indian wars, he once wore a badge in the booming cattle town of Baxter Springs, Kansas. A deadly gunfight with a prominent rancher costs him that badge. He finds his next job enforcing the law in Taylorsville, a new town in the sandhills of Nebraska. The little town is on the road to the lawless Black Hills gold fields. Rustling is rampant. 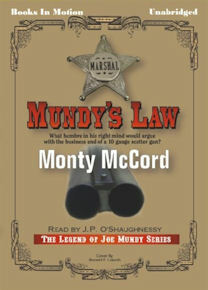 Retribution from Kansas is only one of the dangers Mundy faces as city marshal.